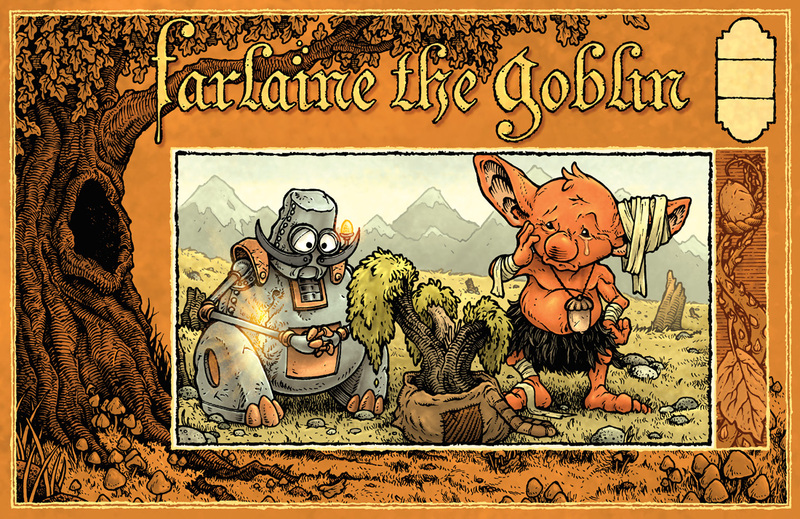 For the upcoming final book of 'Farlaine the Goblin' I did a variant cover! 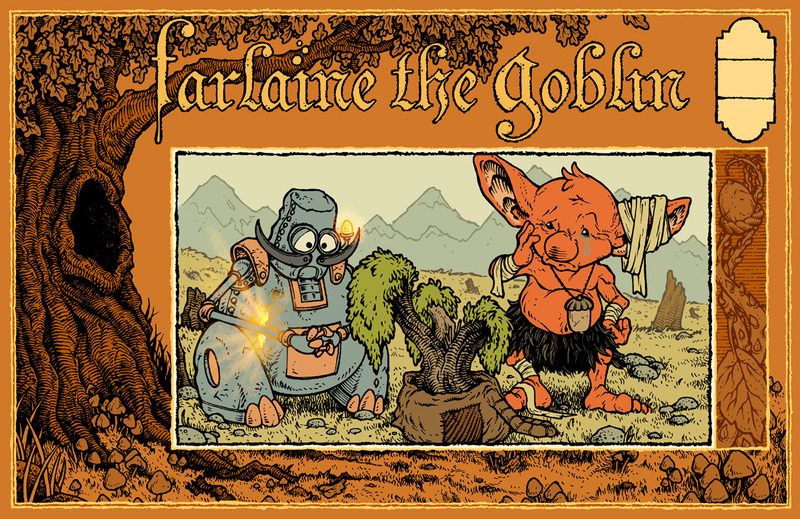 If you are unfamiliar with Farlaine, it's a fairy tale comic story in the same vein as the OZ books. 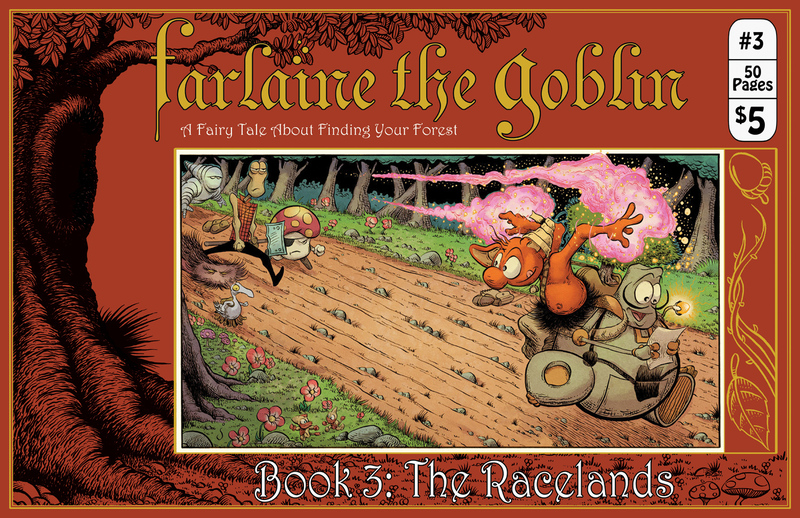 It features a goblin named Farlaine who is looking for a forrest to call his own, and a place that he can plant his tree friend Ehrenwort. He's also accompanied by Drowsy a robot-like creature called a tink. To the left you can see my final cover art, but below is the full process for creating the cover. With the layout set, I printed it out (on copy paper) and then taped it to the back of a sheet of Strathmore 300 series bristol. 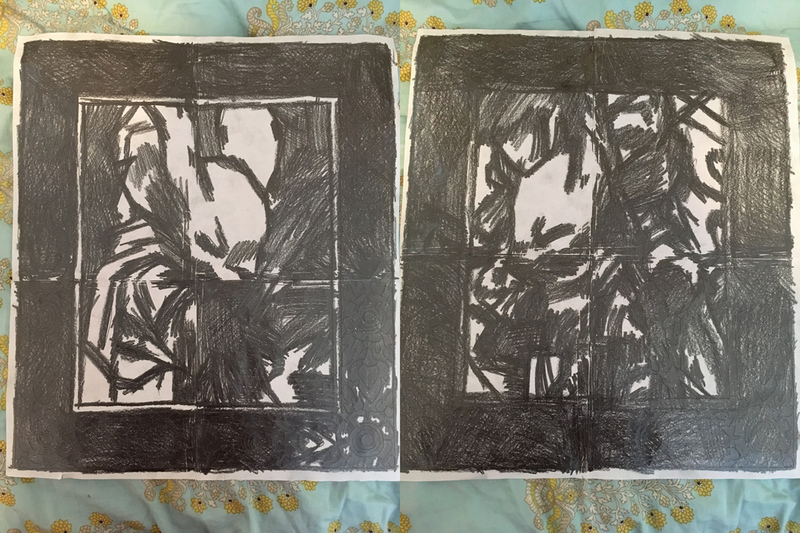 Then, on a light pad, I could ink the piece by using the printout as a guide. 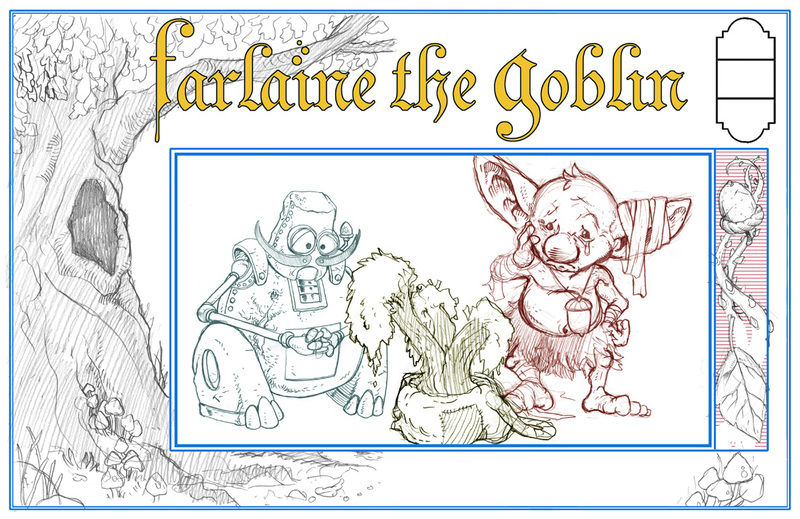 After the inks were scanned, I could start on the coloring process. The first part of that is always to establish the areas of color, where does one color end and the next start. 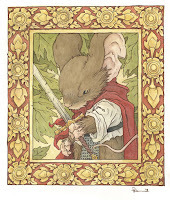 Here I was lucky in that a lot of the color palate had already been established on the previous book covers. And while usually effects are saved for last, I did tackle some of the color holds (areas where I want to color the linework something other than black) here as well as the wound of Drowsey's that lets light pour out of him. The final step was the rendering. Adding light and shadow to the forms as well as some texture. 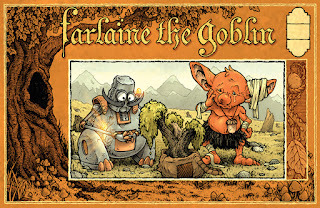 The last book of Farlaine the Goblin will be out in September and is in Previews now for pre-order. 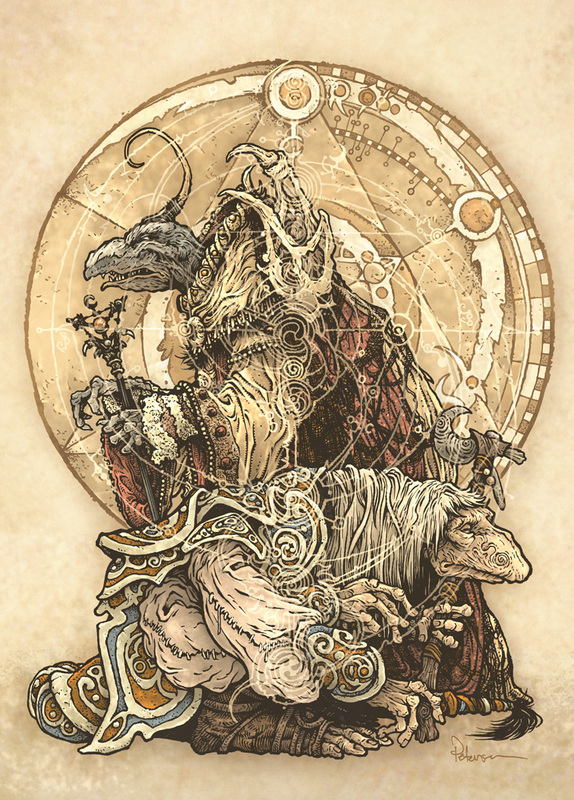 Archaia has a new Dark Crystal comic mini-seires coming out called "Beneath the Dark Crystal". And I've been asked to do a series of variant covers for them! As a huge fan of the Jim Henson company in general, but specifically in The Dark Crystal, it was my pleasure and honor to be asked. This is the first variant cover, with many more to come. To the left you can see the finished variant for #1, but below I will walk you through the art process & creation of each step it took to get there. 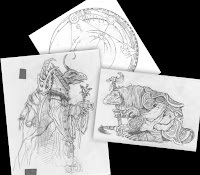 I started with the concept of a Skeksis & urRu (Mystic) facing opposite, almost like a playing card deck's face cards...but without anything upside-down. 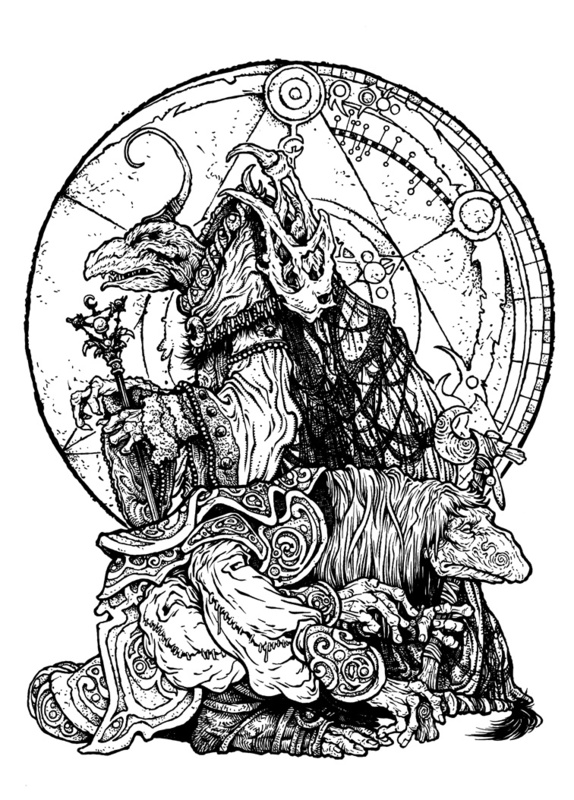 Throughout the film it's noted that the Skeksis & Mystics were once the same beings who split, and that they are each linked to a counterpart in the other species. 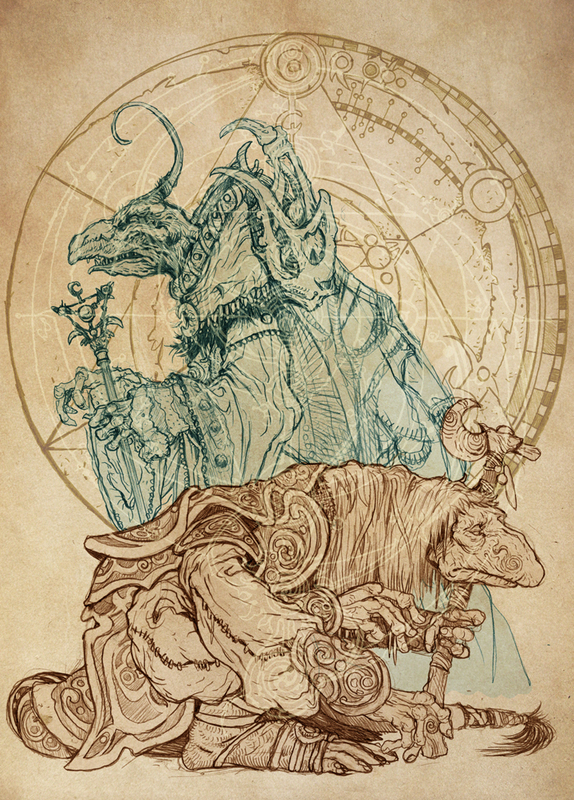 I chose for this image to feature SkekZok the Ritual Master and his counterpart UrZah the Ritual Guardian. I luckilly have a lot of sources for reference with the World of the Dark Crystal book featuring Brian Froud's art, Behind the scenes photos from Henson of the puppets themselves, and the movie. Here are my sketches for SkekZok & UrZah each on different sheets of copy paper as well as a circle design of Froud's I copied for an element in the background. Once scanned I can place the figures just right in relation to one another in Photoshop, even making some digital adjustments to proportions and rotations of heads and hands. Each element was tinted differently to help it read better in layout form. To see more of the background ring, I mirrored each figure so that the important parts of the design were visible. To add some more complexity and texture, I overlayed a subtle version of another of the cosmological magical symbols of Froud's over the entire piece. This layout was then sent off to Archaia and Henson for approval before I could start the next step. When the layout came back approved by both companies, I was able to get into the inks. I printed out the layout and taped it to the back of a sheet of Strathmore 300 series bristol. I inked the piece on a light pad with Copic Miltiliner SPs (I think I used the 0.7 & 0.3 nibs here). On the light pad I can see through the suface of the bristol to see the printout and use it as a guide to ink from. 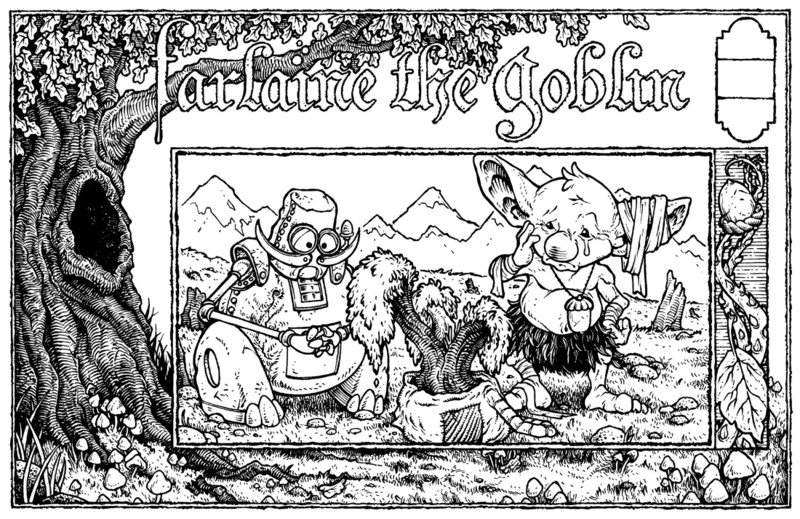 The real trick in inking this piece was how to get all the texture in without over-doing it and ruining any subtlety. The overlay pattern inks (not shown) were done separately to be added in at the end. Once the inks were completed (and approved by Archaia and Henson) I started the coloring process by mapping out the flat colors. This is a process of establishing what areas are what colors in a way that when it's time to render them (shade/highlight/texture) I can isolate any different part at any time. Very lucky to have access to all the reference because other than making adjustments for an overall color tone/gamut and value range, most of the work was dictated by photos, puppets, and art that already existed. Knowing the circle pattern needed to be pushed back to the background I added a color-hold (area where I want the ink lines to be a color other than black) to all of its linework. The last step was to render the piece. Adding in the right amount of highlights and shadow and texture to the piece without overworking it and fighting the linework was not easy. I found that muting everything out and lightening it helped it to read better, got those lines speaking their share of the image. 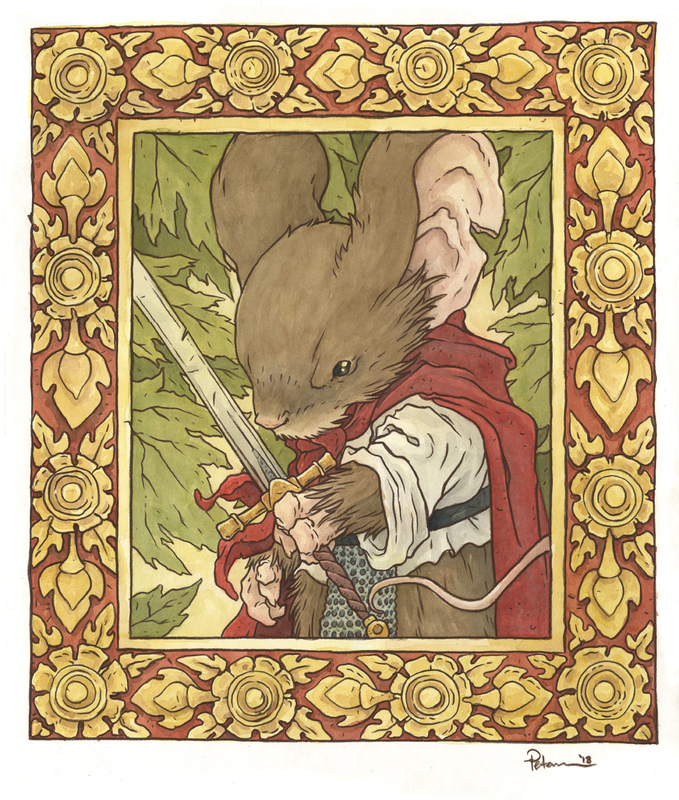 The last step was to add in the pattern overlay and adjust the transparency on it so it was visible but not fighting with the finished piece. 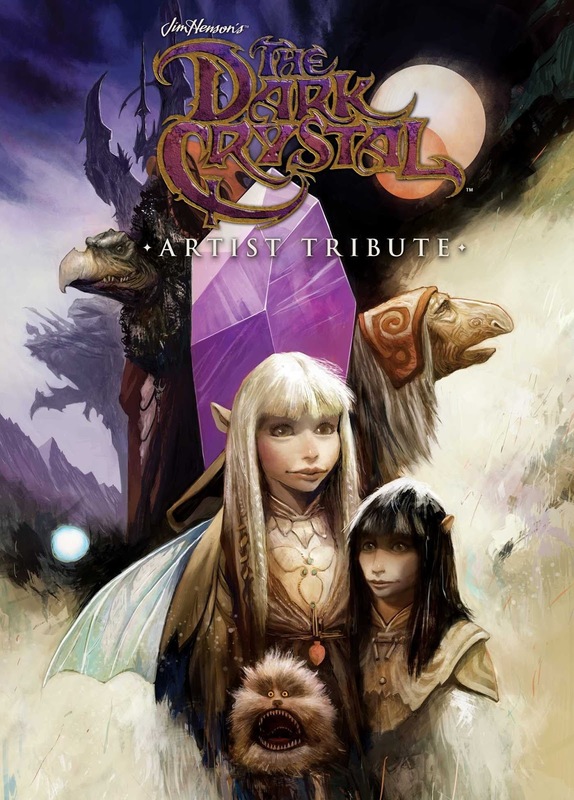 This cover will also be included in the Dark Crystal Artist Tribute book which features illustrations and testimonials from Jae Lee, David Petersen, Mark Buckingham, Cory Godbey, Jeff Stokely, Benjamin Dewey, and the film’s original concept artist, Brian Froud. Available from Archaia in June. Instead of doing one large piece (20" x 32") I decided to cut my surface and do two smaller 16" x 20" pieces. The reason for this is that unlike past years, I did not have someone close to me driving to Heroes to transport something so large as my past pieces...the two smaller pieces fit inside my luggage I'll be flying with to the convention. 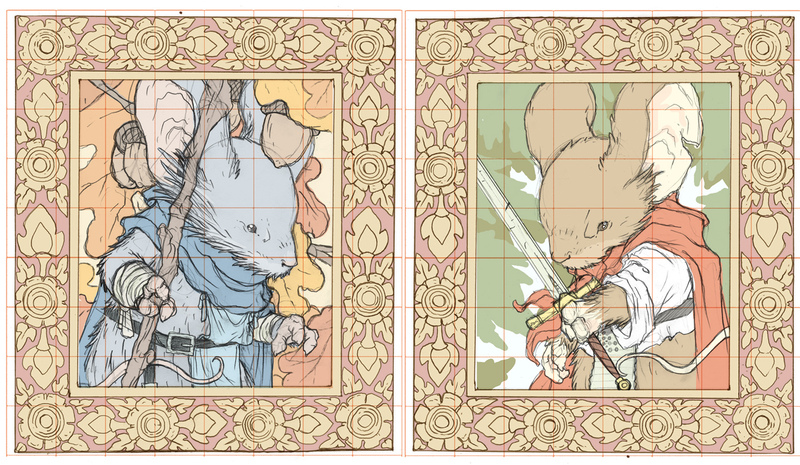 I started by laying out a digital composite of two sketches (one of Saxon and one of Kenzie...both traditionally drawn on paper and scanned) inside a frame border that I interpreted from a carved wooden frame I found doing some reference searching for medieval borders. Once I had the digital composites the way I wanted them, I printed them out to scale. This meant each piece was made up of 4 sheets of printer paper, aligned (hence the grid on the above image) and taped together. On the back side of the taped together printouts, I rubbed graphite all over them...or at least wherever there were lines I needed transferred onto the mat board. 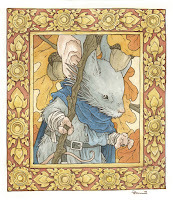 Over one long night I built up layers of yellows and golds and then reds and crimsons to get the border done. Fans on Twitch asked me why I started with the border, and I didn't have a great answer. Some of the reason was to get the big area wash of yellow/golds down as a light color (in watercolor you tend to work light to dark) but I think some of it was also to get the fiddly bit done so that the end of the painting was looser and more organic. 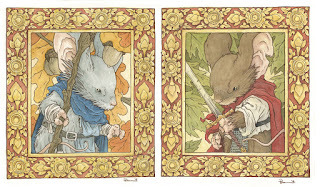 At the completion of the borders of both pieces, I set them aside and went to bed. Two days later when I was able to get back to the paintings and broadcast, I dug into painting the middle areas. I worked mostly from light to dark, building up the larger areas and then focusing down to smaller elements (Kenzie's staff, Saxon's sword) as I got closer and closer to being finished. The last step (seen below) was to 'ink' the piece with a dark brown color pencil. I find that my paintings need a bit of linework and that inking with black ink tends to be a bit too high-contrast and heavyy handed, and the color pencil gives some structure without overbearing the piece with line. One of these pieces will be up for auction at the convention Saturday. The other will be privately for sale at my table on Sunday. 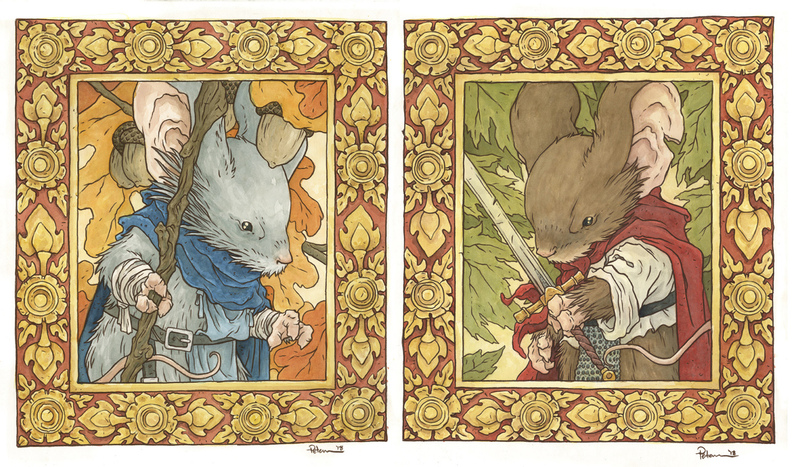 I have also scanned them so that I can possibly reprint them in a sketchbook or art book at some point. 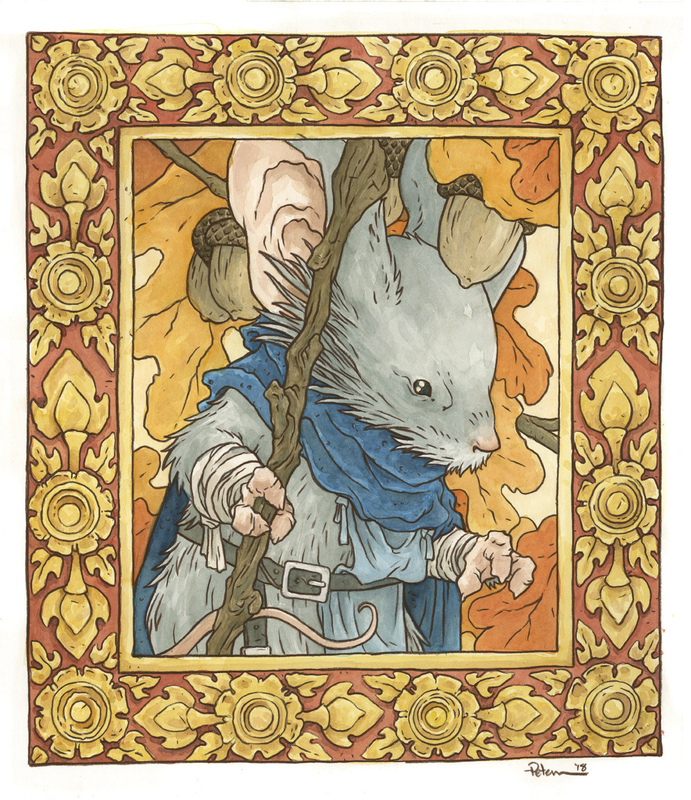 I've made a Creator Commentary video for the fifth issue/chapter of Mouse Guard Fall 1152: Midnight's Dawn. For this issue and the remaining issues in Fall 1152, I’ll be doing the commentary as audio-only. But please feel free to follow along in your copy of the story in either issue form of from the hardcover as I talk about the behind the scenes details, art notes, and my head-space as I go page by page and panel by panel. Enjoy!